- Nota: i tuoi dati saranno utilizzati esclusivamente per elaborare la richiesta. Playa del Carmen una volta era un tranquillo paesino di pescatori, oggi è la località più animata della penisola dello Yucatan insieme a Cancun. Playa del Carmen è situata in ottima posizione, fra Cancun e Tulum, perfetta per visitare le principali attrazioni della Riviera Maya sia con escursioni organizzate che fai da te. Da non perdere la splendida isola di Cozumel, raggiungibile in traghetto dal porto di Playa. Ma chi sceglie Playa del Carmen lo fa soprattutto per la sua animata vita notturna e per l’ampia scelta di locali, ristoranti e resort, ed è quindi la meta ideale per chi ama il divertimento, le discoteche o i viaggi all-inclusive. The Riviera Maya is a tourism and resort district in Mexico. It straddles the coastal Highway along the Caribbean coastline of the state of Quintana Roo, located on the eastern portion of the Yucatán Peninsula. This district historically started at the city of Playa del Carmen and ended at the village of Tulum. Target areas for urbanization include the towns and villages of: Puerto Morelos, the Riviera Maya), Puerto Aventuras, Akumal, Chemuyil, and Tulum. 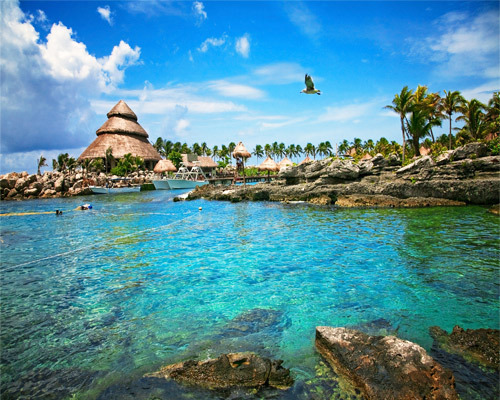 A major attraction throughout the Riviera Maya are coastal and reef aquatic activities dependent on the coastal water and the Mesoamerican Barrier Reef System which begins near Cancun and continues along the whole length of the Riviera Maya continuing southward to Guatemala. This barrier reef system is the second longest in the world. Activities at the most visited locations include jet-skiing, snorkeling, scuba diving, swimming in cenotes, swimming with dolphins, zip-lining, horse riding, sailing, and guided jungle tours. Archeology is also a big tourist draw in the area, including the popular archeological sites operated by the Instituto Nacional de Archeological such as Tulum on the coast, and Chichen Itza and Coba located some distance inland.